When the New York Times series on nail workers hit the streets May 7 and 8, 2015, Governor Cuomo and other public officials reacted swiftly. Within a few weeks after the news broke of worker exploitation and also allegations of increased health risks for those who work with nail products, the state of New York passed new legislation specifically for the nail industry. 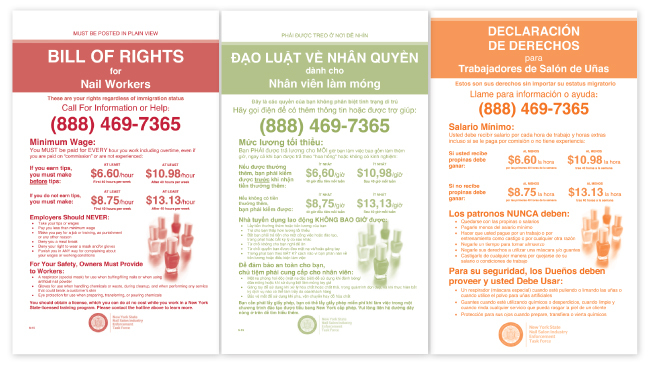 Under the direction of a new Nail Salon Industry Task Force, the state of New York requires all salon owners to post a Bill of Rights for Nail Workers in a prominent place. Workers also have the right to request PPE (personal protective equipment) and have each nail station equipped with fans. Both nail techs and clients are encouraged to report unlicensed salons or salons in violation of any state law on a toll-free hotline (888-469-7365). New regulations for salons are being discussed by lawmakers, such as bonding and instituting a health grading system similar to the food service industry. And the debate continues over health effects, acceptable exposure levels, and what constitutes a safe working environment. More studies are needed to identify the probability of long-term effects and help nail professionals differentiate between acceptable exposure and overexposure. Still, the work of the NYT journalists serves as an important eye-opener not only for those in the profession but also the consumer. The role of every nail professional is to stay ahead of the curve, practice meticulous salon work habits, and be able to answer clients’ questions responsibly and factually. While New York is at the epicenter of these reform efforts, other states may soon follow. Nail professionals and salon owners should stay up to date and also keep their clients informed. Many have already been doing this for years and can now benefit by the additional resources issued by local, state, and federal agencies. Look for continued news updates in the magazine and here on our website. The state government’s website offers detailed information about the various legislation being enacted to monitor salons and protect nail techs. It includes links to news releases and news stories related to the reform and makes available both the Nail Workers Bill of Rights and the 5 Things You Need to Know download. OSHA publishes “A Guide for Nail Salon Workers” and it is updated regularly. The guide offers information about common chemicals and potentially toxic substances commonly found in nail products and how to work with them safely. Be sure to note the dramatic reductions in chemical levels during acrylic removal when a ventilator system is in operation. The NMC operates within the Professional Beauty Association, founded in 1990 to disseminate factual information about professional nail care products used in salons. Most recently, the NMC issued statements about UV lamps, which in 2013 were targeted as a cancer risk. Doug Schoon, a regular spokesperson for the NMC, discusses proper health and safety precautions that will keep exposure low. Read up on vital topics including nail product ingredients, nail hardener ingredients, the truth about MMA, and tips on staying healthy. Many of the reports are translated into Korean, Spanish, and Vietnamese. Although based in California, the California Healthy Nail Salon Collaborative works to gain more transparency in labeling products, identifying potentially hazardous ingredients, and helping nail professionals understand their rights and how to work safely. One of its programs, the Healthy Nail Salon Campaign, provides support to salons that show good responsibility in product use and labor practices. There are 10 requirements for salons throughout California wishing to be part of the program. A directory is in place to point consumers to the designated Healthy Nail Salons. Billing itself as “Advocates of Safe Pedicures,” the International Pedicure Association promotes safe pedicuring practices with membership services, education, and links to relevant articles. The association is a partner with the North American School of Podology, Medinail Learning Center, and The Academy of Nail Design.